Elliotts will be showcasing the new Pro-Tech 8 firefighting gloves at AFAC Conference in Sydney. The Elliotts Team would like to invite you to visit our display (Stand 129) at the AFAC Conference in Sydney this August. We will be displaying our new X- Series Firefighting suits along with other structural and wildland protective clothing . We will also be showcasing new fabrics and fabric combinations that help improve the comfort and protection of modern firefighting apparel. -OneSuit® Shield Level B: ONESuit® Shield is Saint-Gobain's latest advancement in hazmat suit protection and features a unique mask interface. ONESuit® Shield suits are Level B suits, certified to NFPA 1994 and 1992 Standards. - Pro-Tech 8 Firefighting, Rescue and Extrication Gloves: The ProTech 8 Firefighting gloves are certified to NFPA1971-2007 and are designed for maximum comfort, dexterity and protection. Come along and try them on for yourself, we will have a full range of samples in all sizes on display. The conference features international and local speakers across all areas of interest to the industry. It also features a large trade suppliers exhibition and a major poster exhibition. Trade support of the conference as well as many AFAC/Bushfire CRC projects is substantial. 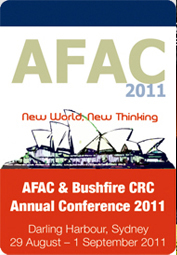 The industry's premier annual Conference, the 2011 AFAC, Bushfire CRC Conference will be held in Sydney.